I will recreate 'Priory Meadow Cricket Ground' of Hastings ( 1864-1996) in 3D with immersive soundtracks, using augmented reality* triggered when viewing special vintage postcards, the experience will happen on all smartphones & all of it will be distributed free. If you fund this project you will be helping me to preserve amazing lost local heritage in digital art for many other people to continue enjoying nostalgic landmarks, and for many generations to come. I will also create an experience with audio history and 3D model of a group statue of King Harold II and his common-law wife Edith (Ealdgyth Swan-neck, also known as Edith the Fair, and most commonly Edith Swan-Neck). Harold is lying on his back dying and the figure of Edith is hunched over him, holding up his head towards her face. The sculpture is severely weathered and virtually none of the carved surface remains (originally Harold’s chain mail sleeves were present for example). Prominent areas of carving such as noses and fingers are now eroded. Soil and sand have become deposited in the crevices of the carving. I will do this alongside Ian Macintosh who is campaigning for a roof for the statue. 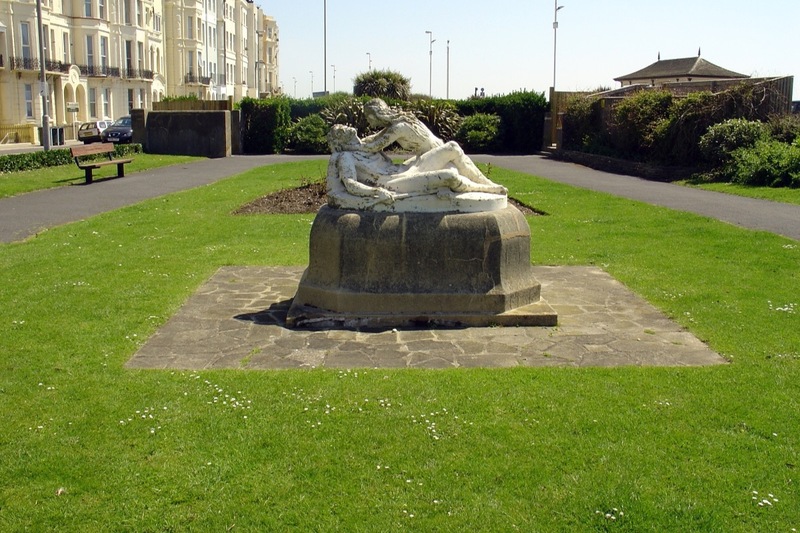 The statue is still outside at Grosvenor Crescent / Sea Road St Leonards on sea. An augmented reality version will be an additional outcome for this amazingly powerful statue that has a lot of stories to tell. 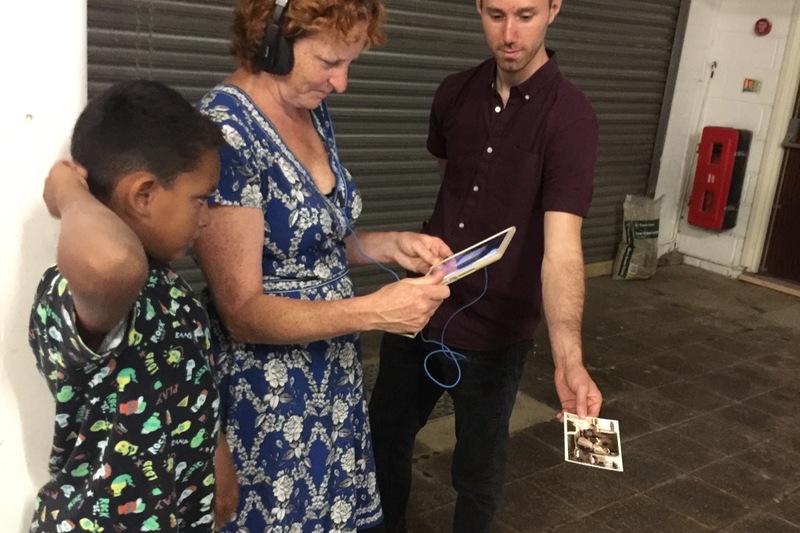 By supporting this project you will be helping me deliver to older people who engage less in technology (in this case 'Augmented Reality', and ultimately to everyone who can access it by using a smartphone and adding headphones to have an immersive exploration of this bygone place, truly rich in memories. Is your organisation involved in heritage / memory projects and could support local art ? I have added rewards to incentivise larger donations and can discuss this with you. Maybe you could host an exhibition of submitted Cricket Ground stories over 130 years and I could display this in your centre. Smartphones are ubiquitous tools and I have already released an app designed with professional legacy in mind, like a museum in your pocket. Costs include new site build, hosting & maintenance, it will not expire after a year or two. The short video shows what we see through the iPad and iPhone when using the current artwork 'Apparitions' that I have made so far in 'augmented reality' . From looking at a map 3 lost local landmarks are triggered in 3D with sounds from postcards. Priory Meadow Cricket ground will be added to this app as a new experience. 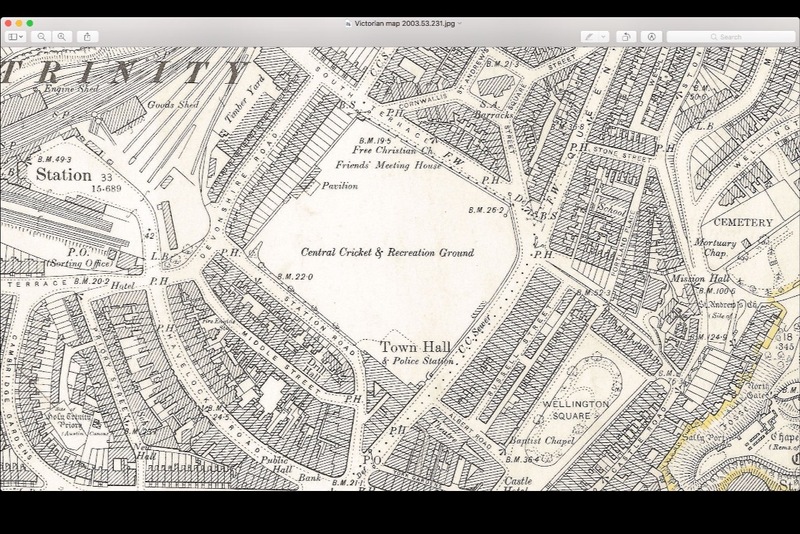 During 2018 I launched an app thats runs on iPhones called 'Apparitions' for free ( thanks to a generous support from The Arts Council of England ) and from all the public feedback I gathered, it was clear that The Priory Meadow cricket ground (once dominated the heart of the town centre in Hastings) would be a very popular addition. It was only demolished in 1996 for a shopping centre, so many people still have great memories of it , and I could recreate in the same way as I have done with The Memorial & St Leonards Pier - shown below in this short video. The above image is The Memorial (1862-1973) triggered from a second floor window in the Memorial Gallery on Robertson street to attempt to recreate it close to its original site. You can see Hastings Castle in the background, this is looking to the east. This is very close to its original location in the town centre where it stood for over 110 years. However only persons looking through the smartphone app can see the Apparition. The illustrated vintage image above this shows the Clocktower back in the day. The cricket ground was both close to the sea and the town centre, where another major local landmark resided that I recreated in the first version of the app - The Memorial Clocktower (1864 -1973) and below are a series of screen grabs of the 3D model we made that magically pops up in the smartphone when viewing a postcard of it, anywhere. It was used for first-class and List A cricket between 1864 and 1996. The ground was frequently used by Sussex County Cricket Club as one of their outgrounds from 1865; in total, Sussex played 143 first-class and 17 List A matches at the ground. 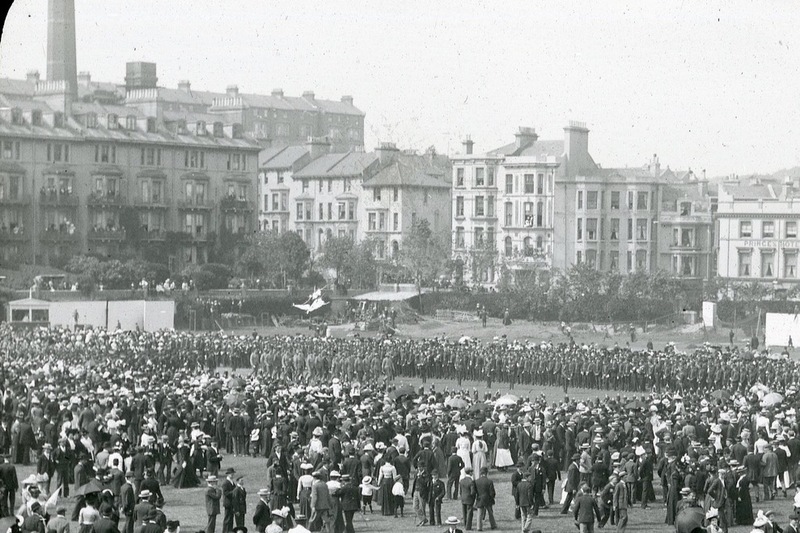 Between 1887 and the 1960s, the Central Recreation Ground also played host to the Hastings & St Leonards cricket festival, which attracted many other teams and notable players. In the early twentieth century, the ground hosted seven Gentlemen v Players matches, and notable players to have played at the ground include W.G. Grace, Don Bradman, Jack Hobbs and Denis Compton. Grace made over 40 appearances at the ground, whilst both Hobbs and Compton broke the record for most first-class centuries in a season at the Central Recreation Ground. 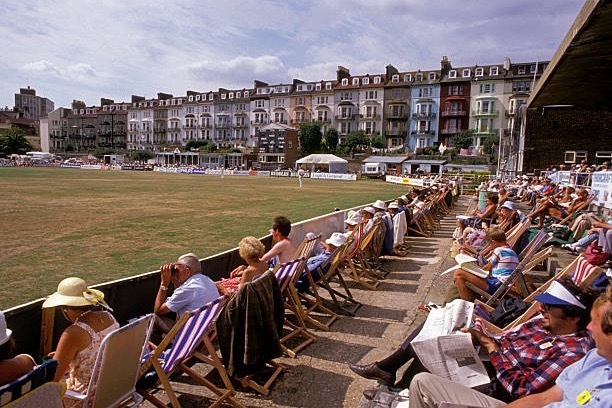 The ground also hosted a women's one-day international between England and New Zealand in 1984. The experience is for anyone that can see or hear the time-travelling phenomena of Apparitions. Smartphone savvy younger family members can show elders how to use it - by pointing the camera of the smartphone and the postcard and rotating it, you effectively modify the result as you 'zoom-in' to different pockets of sounds, samples, eras and atmospheric ambience. Seeing an 'Apparition' artwork pop out in augmented reality is particularly magical for older people who have real memories of the lost place or a fondness for a bygone time. Triggering memories, nostalgia, and encouraging interaction (as family members assist each other in touring the virtual model experienced using smartphones) can increase reminiscent discussion and generate new threads about Heritage preservation with social & historical importance. As more and more new people move into the town and we witness its gentrification, I realised they (like me once) maybe oblivious to what once stood here. 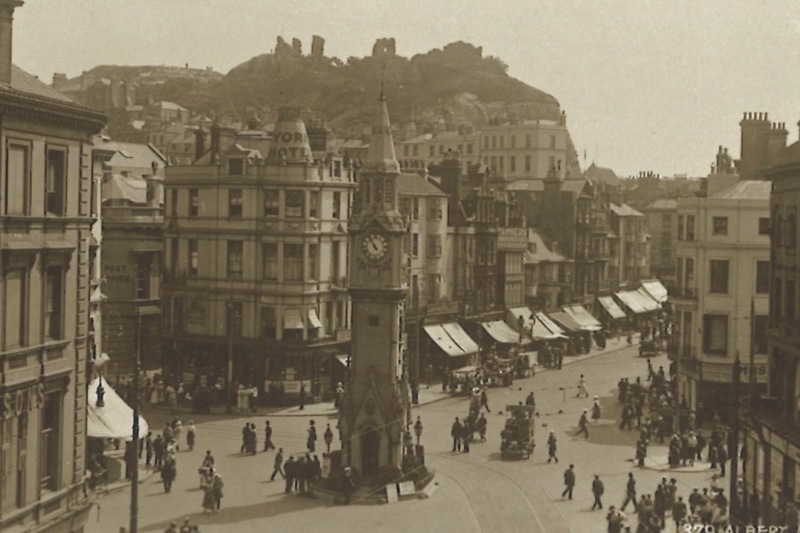 Sometimes the damage was sustained by bombs during the World Wars, but sadly others were removed due to council issues such as town planning improvements. You can experience what I mean by trying my artwork called 'Apparitions' launched in 2018 - here demolished historical landmarks reappear like ghosts when viewed in Smartphones through a technique called augmented reality*. The artworks can preserve lost heritage and illustrate the errors of demolishing the past (and the need not to repeat them.) Even more pertinent and controversial right now as we see Hastings Pier is gated and been shut since December after changing ownership in June last year and harsh budgets cut for Hastings Borough Council trimmed funds for all areas including the arts. Crowdfunding will allow me to build on the current app - updating it with the new lost heritage and by covering the costs of a version that will loads onto Android phones (current app only runs on Apple devices ) to reach as many people as possible. You don't have to be in Hastings or St Leonards to have the experience. To view 'Apparition's you use an Apple iPad or iPhone (an Android version is in the process of being developed) and the Apparitions app, which is triggered by viewing with the device’s camera one of the three postcards which were produced specifically for the project. Here is a short video of the model my designer made in SketchUp3D software, much attention and detail was applied to unique railings, kiosks with Edwardian finishes and scale is perfect. Sound is very important in making Apparitions 'immersive' with time-travelling powers in its postcard portals, so interviews with locals who remember it well, have interesting anecdotes will be invited to capture their personal and classic memories that maybe lost when the older generations pass away. For instance I have heard memories of a great cricket commentator often arriving for the day with a box of wine, special matches that ended spectacularly, ambient and family memories with atmospheric noises encapsulating its existence from 1864 - 1996 will be assembled digitally to experience whilst viewing the model and postcard. Extra media eg : photographic records offered from the general public and their associated voice recordings and like material will be on show in Hastings Priory meadow shopping centre and ideally in the museum & Art Gallery later this year & Bexhill museum. I am a mid career independent artist and researcher ( Greenwich University : Dept of Psychology) and I have researched & collected images of lost landmarks in my hometown of St Leonards & Hastings, East Sussex, UK because I am fascinated by the relationship of history, new technologies, memory & dreams. This led me to create a mobile phone artwork that brings them back to life in 3D with sounds. The Apparitions project required me to find the right people to help make it happen, and I managed to secure some Arts Council of England funding to release a version for iPhones in September 2018. Postcards sponsored by 'Judge Sampsons' the local classic postcard printers were distributed free in specific locations including Source Park, Royal Victoria Hotel and Hastings Museum with instructions to download the free iOS app and to explore. For the initial smartphone app that triggers the lost landmarks 'Apparitions' I employed other creative experts to help me realise the work professionally in 3D modelling, user interface and the mobile app design. I will continue to work with the three main people for sound, user interface and 3 modelling for this next location. I use my creative talents with the brainwave technology as a way to exemplify mediation and enhance creativity as a consultant and I also teach monthly on the Digital Media Arts MA in Brighton university. So far Apparitions app has 3 sites - all these places no longer exist; the Clocktower was damaged by arson and subsequently demolished in 1973, the pier suffered bomb damage in World War II and then severe gale damage and was demolished in 1951, while the beach huts were destroyed in a storm in 1905 and almost all of their contents washed out to sea. Whilst making and showing the work in public in Hastings & St Leonards it became apparent there is a strong nostalgia for Priory Meadow Cricket Ground in Hastings (1864 - 1996), which was demolished to make way for a shopping centre in the 1990's. Lots of people who filled out the feedback forms requested this as the next site I should make. Also the need for a separate build of the content that will run on Android phones is vital, as the current market shows a large bias for owners of non-Apple devices. To cover the costs for use to recreate the fourth attraction - a nostalgic cricket ground in 3D, optimised for mobile phones and with a 2 minute soundtrack that encompasses highlights of its existence, matches and visitor memories. This will be launched to coincide with an exhibition about the Cricket ground with the public invited to submit stories and photos for us to display in a multi media exhibition in Hastings museum & Art Gallery or even in the shopping centre that stands on its original site. 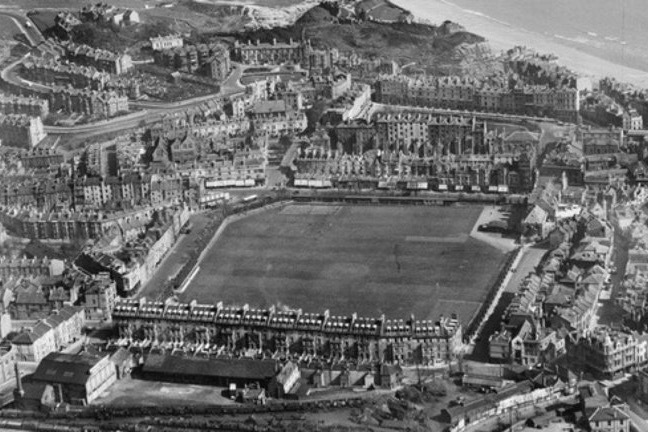 The cricket ground will be triggered from a postcard image, and rotated to explore in more detail. Match Highlights, unusual occurrences & memories will emanate within a soundscape that contains found and simulated recordings to help travel back in time. From Edwardian times to the 1980's the ground's game Stories will be preserved in this unusual way. A soundscape can convey events in augmented reality attached to different parts of the postcard - for instance : In 1905, the ground hosted a circus, in which American tight rope champion Hermann Davidson fell 60 feet (18 m) to his death after falling off the balancing pole during a performance. Davidson was 45 years old, and had begun training to be a tight-rope walker at the age of 10. In 1948 it flooded, the ground had previously flooded in 1866, when one resident noted that it had been underwater many times within their memory. 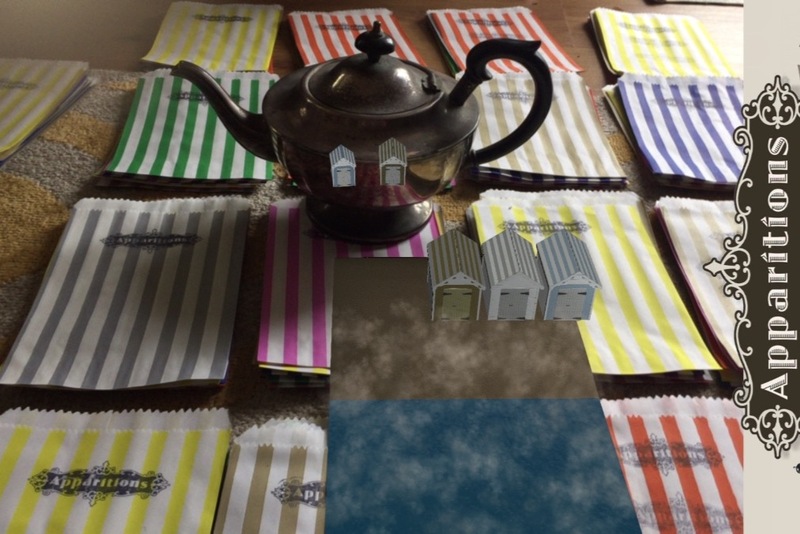 The above & below images show people experiencing 'Edwardian Beach huts' which are 3D models moving in a mixed reality scene, with the real teapot that survived the storm that destroyed all the huts in 1905. The story of this event is narrated when viewing the huts that appear to bob about before disappearing into clouds. Click on the video with dog here to see a very short video recorded through the screen of an iPad as the augmented reality occurs..
"What a beautiful event this was ! 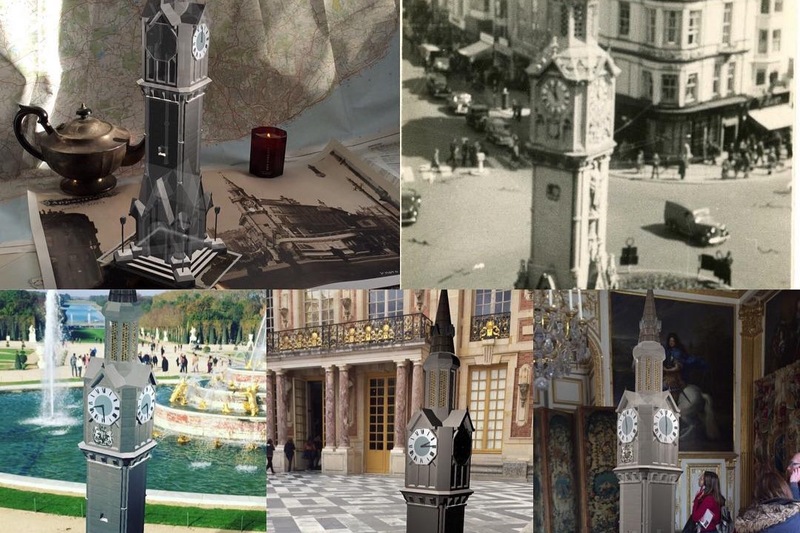 An exciting, tasteful blending of past and present through augmented reality software. Bringing memories back to life using sight and sounds ! 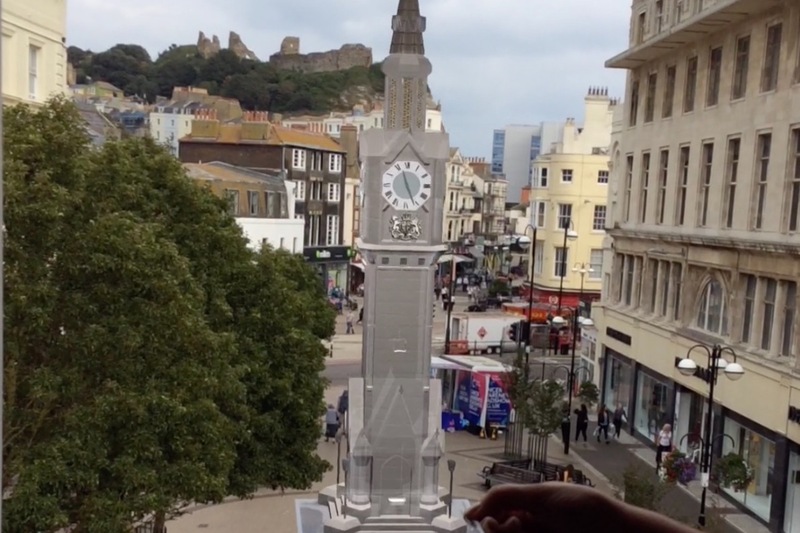 "Fantastic to see iconic Hastings landmarks come to life. the immersive sound track. Brilliant!" "Remember the promise of cyberspace, as presented in Gibson's novels? Or the VR holo-ads promised for 'the future' in Tokyo? these things have been emerging in reality for a while. new VR specs, live-fi and smart phones with apps all offer new and exciting possibilities. Apparitions is a great showcase for iOS platform VR modelling, very cleverly triggered by the external art postcards they've produced of old Hastings & St Leonards landmarks. I recommend spending time on the Palace Pier especially, it;s soundscapes are excellent too. Scaled up, invested in, and built on other platforms too, with next-gen phones handling more & more data, this is the future of extropian-wear, with 3D cinema-level rendering the lofty goal: These guys deserve a place at the table!" We will add extra functionality - a 'swipe screen' to reveal before and after of the site over the years can be built in. As well as a simple 'one-touch' screen grab function to encourage people to capture 'AR' layered over present reality making more creative photo opportunities both in town and abroad. I could also create another Apparition model with sound from local heritage from public demand such as the the olympic Lido / Bathing Pool, Amsterdam shipwreck, Sommerfield house, or Castle we could organise a contest to request which place next. I can also offer rewards ! Receive 5 complete sets of all 4 Apparitions ( including the new cricket ground ) in a special stamped bag with the app download ahead of public release. Quality UV resistant ink 'Giclee' numbered & limited edition A4 size print of any Apparition for wall hanging in a mitred mount ready for framing, they will trigger the experiences like the postcards but are good for hanging at home. An A1 size limited edition poster print of any of the Apparitions for wall hanging - suitable for bars, clubs, hotels foyers & other larger spaces. The app can be experience by many people at the same time on unique devices whilst sitting down if the posters are mounted at shoulder level . You need wifi only for the intitial 'app' to download then it will work absolutely anywhere with the postcards and works offline. 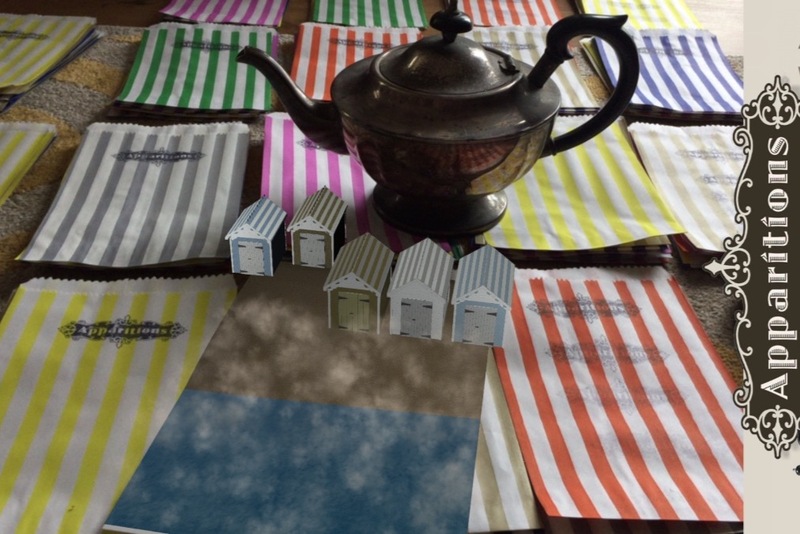 When the app is first loaded a metal plated teapot bobs gently in one corner, which you touch to launch the artwork and it is also featuring during the Beach Huts section of the augmented reality experience. You use the camera of your smartphone to literally zoom into the model and the sounds change with it.. along the pier for instance are different activities like bowling, skating, dancing, gossip, a zoo even !